In conjunction with marches held nationwide, thousands of demonstrators gathered at Rosa Parks Circle in downtown Grand Rapids on Saturday, March 24, to express support for victims of gun violence and demand more gun-control legislation. 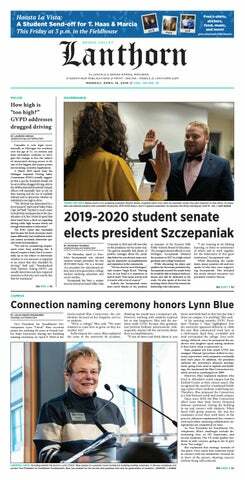 Fifty-three Grand Valley State University students are running in the student senate election this year. Voting will be conducted online at www.gvsu.edu/studentsenate, and students may vote for up to 10 candidates of their choice from Monday, March 26, at 8 a.m. to Monday, April 1, at 11:59 p.m.
As the end of the 2017-18 academic year approaches, the Grand Valley State University student senate continues to work on finishing projects and preparing for the transition to a new body. The general assembly on Thursday, March 22, had an agenda full of important information. With such a large number of students, it’s no surprise that Grand Valley State University offers as many extracurricular opportunities as it does. According to the Office of Student Life, there are more than 400 student organizations on campus. But with so many opportunities for involvement, the money it takes to fund the organizations has to come from somewhere. A new plan is being designed in the city of Grand Rapids to remove the Sixth Street Dam and five other smaller dams. Jay Steffen, assistant planning director for the city of Grand Rapids, detailed the specifics of the new plan at the “Grand River Corridor Planning” event that took place Monday, March 19, in Mackinac Hall. The Dorothy A. Johnson Center for Philanthropy at Grand Valley State University is receiving a generous gift from namesake and co-founder Dorothy Johnson. Over the years, she has been consistently active in the betterment of the center, and her latest contribution will pour nearly half a million dollars into the creation of the Dorothy A. Johnson Philanthropy Innovation Fund. Lynn “Chick” Blue, vice president for enrollment development at Grand Valley State University, announced her intention to retire from the university at the end of 2018. Her retirement will conclude a 50-year journey at GVSU. As Grand Valley State University President Thomas Haas announced his impending retirement in February, the GVSU Board of Trustees announced that the search for his replacement was underway. On Tuesday, March 20, the members of the presidential search advisory committee (PSAC) were announced. Political views are a topic of discussion often avoided by many due to conflict. However, it is the job of political organizations and clubs to embrace these conversations head on and engage in civil discourse with one another. On Tuesday, March 13, three major political clubs at Grand Valley State University did just that. Members of the College Republicans, College Democrats and Lakers for Liberty gathered in the Kirkhof Center on GVSU’s Allendale Campus to discuss relevant and controversial issues.